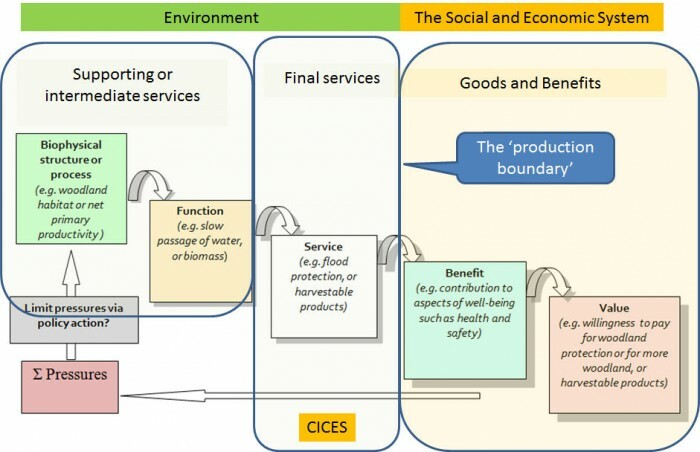 Supporting services or ecological functions are the underpinning structures and processes that ultimately give rise to ecosystem services. Some have also described them as ‘intermediate services’, although the term intermediate services is not used in the context of CICES. A classification of these underpinning elements is not covered in CICES which seeks to identify the final services that link to the goods and benefits that are valued by people. CICES provides a classification of potential (i.e. putative) final services. It is up to the user to decide whether in a particular application context, the service is to be regarded as final or not, or whether the particular ecosystem property or behaviour is regarded as having a more underpinning role (and could thus better be described via an assessment of ecosystem condition). The issue is discussed in greater depth in the technical guidance for V5.1. After: Potschin, M. and R. Haines-Young (2011): Introduction to the special issue. Progress in Physical Geography 35(5): 571-574.